Sinead Devaney won her first match in a UK-Racketball Series event over coming Jack Owen 2-0 but the group was decided between local player Clair Williams and Series veteran Jo Moseley, with Moseley coming through to take the match 2-0. Fantastic match between Elaine Gilchrist and Debbie Hill with Hill taking the first on tie break only to see Gilchrist come back strong in the second to set up a decider that Hill managed to come through 11/7. 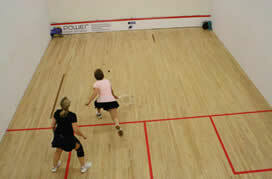 Elaine Gilchrist had a tough match with local Debbie Hill. Both players showed some excellent touches and used the whole court to good effect. Debbie took the first game after some long rallies, but Elaine came back well in the second and deservedly finished it off in some style to level the match. Elaine started strongly in the decider, but Debbie demonstrated patience and gradually took control through a great variation in length. Debbie won in an entertaining match, a credit to both players. The group was decided by Kathryn Milne who stayed strong throughout the group defeating both Gilchrist and Hill 2-0. It was always going to be hard fought, both players are very competitive, used to winning and both on form. Milne was runner up in Chichester and Mosley runner up in Abbeydale the last two Series events so this was always going to be tough. Despite retrieving like Mosley always does, Milne proved too strong, moving the ball around well and forcing Mosley into the corners, 2-0 to and title to Milne. Mosley has had a fantastic Series and with 1175 points already accumulated before Wycombe meant that whatever happened on the day she would crowned Champion. A fantastic effort, she finished on the most points every earned by a woman across a whole season! Top seed Patrick Osborn made it through without dropping a set. It was Mike English who has been getting used to competing right to the end of UK-Racketball Series Events who drew the short straw of Buzby Williams in the group. Buzby has only just moved into the Over 50’s so is yet to record a ranking but everyone who has seen him play knows he can be a real handful. Buzby claimed the group without dropping a game despite English giving everything he had, with Stephen Uttley and local player Gary Wyatt also battling hard. Ed Smith who was promoted to the 50’s after success at Abbeydale in September found himself in one of the toughest groups of the day and despite running hard failed to notch up any points against either Slocombe, Clarke or group winner James Murphy. In his other matches Murphy found himself down against both Slocombe and Clarke but both times managed to find a way back (as he so often does) to come through as victor, his dogged determination always seems to get him home in the end. If there is an over 60’s grade next year he will be a real handful. Janak Malkani continued where he left off in Abbeydale defeating both Paul Backhouse and overcoming Gabriel Uttley 2-0 (which is never easy to do) to claim the groups top spot. It was a battle. The last match of the day, they were both tired, both hurting and yet it still managed to go right down to a tie break in the decider before they could be separated. 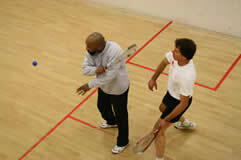 Buzby has loads of weapons, good movement, a straight kill, cross court lob and tight drop. Malkani less weapons but the ones he has are reliable, a very good two wall boast, a tight straight drive and a dogged determination to never give up. It was always going to be tight but at 1-0 and 10-5 to Malkani it looked like it was all over, he tensed up though and Buzby sensed the change in momentum, 6 straight points, 5 which were match balls and he had one of his own which he took first time to level at 1-1. At the start of the third amazingly Malkani got the momentum back. He hit long, got his boast into play and cut out the mistakes, 10-6 up this time and again with several match balls surely the match must have been all over this time, but again Buzby had other ideas. He again saved all the match balls to set up a tie break, Malkani fought hard though and earned another tie break match ball, then had to save one of Buzby’s but the momentum was always going one way and a trade mark straight kill finished the tie and earned Buzby another title. 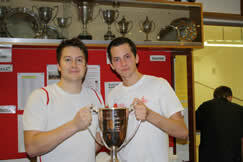 The group winners were Alex Musselwhite, Ed Walker and Oliver Adams. It was only Musselwhite who dropped a game in the groups managing to scrape past both Nick Wynd and David Heron in close run matches. Local club junior Ed Walker looked more comfortable in group B but Alex Glencross and Jack Gilchrist brought him close. Oliver Adams held the third group under control with 2-0 victories against Peter Widdowson, Gregory Zabinski and Brendon Bennett. It was a 3 way winners group to decide the B grade. Musselwhite ran hard but couldn’t contend with the control of either Walker or Adams to set up a final between the two victors. Neither had dropped a game all day so it was always going to be hard fought. Adams has some great shots and isn’t afraid to go for them which was great to see but Walker retrieves well and on home turf he looked determined to win. Not giving in for a second Walker managed to battle through and see off the challenge from Adams, the host club finally had a winner, 2-1 to Walker. Ted Jeal was leading the Series rankings going into the day and right from the outset he looked determined not to let it slip. He quickly dispatched all 4 of his group opponents including 2 England top 20 players Proudfoot and Garrett along with the inform Elliot Selby all 2-0 to claim the top spot. Rich Davies came through top of the group but he had to battle hard to overcome Paul Johnson who soaked up pressure and retrieved right to the bitter end. Despite a monster rally on match ball however it was Davies that came through but Johnson got a tremendous number of balls back. Norton also took Davies close, he was hitting the ball well and Davies seemed to still be feeling the earlier battle with Johnson. In the end though Davies was to steady, lifting the ball well when he was in trouble and then making Norton pay when he got him on the end of rallies. 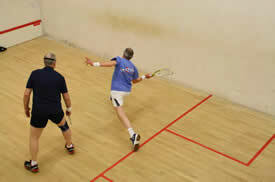 In the end Norton ran out of steam and ideas and Davies took the 3rd comfortably to claim the match 2-1. Tom Phipps was second in the Series (only 30 points behind Ted Jeal) so still in with a shout at retaining the Championship. In his first 2 matches he despatched Johnson and Norton 2-0 but couldn’t continue this form against Davies. He made a bad start in the first and never really recovered losing in quite a long but comfortable 2-0. It was always going to be a clash of styles with Jeal looking to take the ball early, hit hard and take the initiative and Davies always trying to hold on, keep the ball going and then wait for either a tin or a loose ball so he could play the straight drop. In the end Davies was too solid and it was heart break for Jeal who wanted to end the Series on a high with a title but with Phipps losing early he still had enough points to get his name on UK-Racketball Series Champion trophy! England Squash’s Marie Gook and Amanda Robinson both played well in their first UK-Racketball Series tournament with Robinson coming out on top in the very last Beginners group match of the day. It was great to see the ESR guys taking part and seeing what the Series is all about. Serge Mbikina and Robert Boulter fought each other hard in the battle for second place but in the end it was Boulter who came out on top of the MK man and veteran of Abbeydale beating him 2-0. The grade decider turned out to be between Boulter and Lee Divers. Both are young, fit and quick but in the end it was Divers who was the more consistent coming through the match 2-0. On the end court it felt like the Over 40’s were right out at the end of the club, doing battle on the coldest court with the least viewing might have been hard for some but Series Champion Jason Russell again opened his account well with straight game victories over Morse, Miles and Robinson. England no.11 Darren Beckett brought him close but Russell was to strong coming through 2-1. 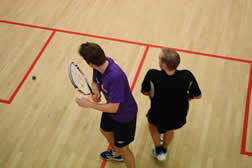 The second group came down to a clash between James Powley and Marc Thornley. Both have played many events before and were looking determined to reach the final. Powley looked to take the initiative and Thornley tried to stem the tide with good retrieving and tight racketball but it looked like it was always going to be Powley’s day. A tight battle but to many winners from Powley’s racket for the result to go any other way. It was another great over 40’s final between the 2 group winners Russell and Powley. Russell always digs in well so Powley knew he had to find some winners. It worked though with straight kills and nick boasts being brought in at every opportunity. Russell never gives in without a fight though and fought back hard in the 2nd but Powley was too accurate, a great final to round off one of the most competitive groups of the day. This is the last event of 2012 so now we have the 4 month wait till 2013. 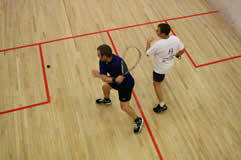 WSRC will be hosting its first UK Racketball event on 24th November. With this being the final event of the year for UK Racketball, a large entry is anticipated ahead of the Christmas break. 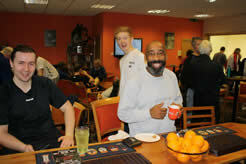 The club itself is a five court venue with a comfortable lounge and bar which is run by the members for the members. The club runs a complete coaching programme with several teams in the Bucks county league including their men’s first team, who are the premier league champions. The event will be looking to attract not only a high standard, with several top class players living in the area, but also with a thriving Racketball section at the club the event will be sure to cater for all. 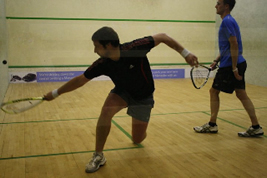 So do not delay, as this will be your last chance to play in a UK Racketball event in 2012. Five championship courts, lounge area, bar.